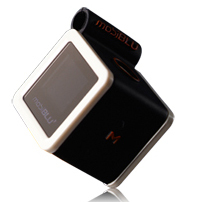 Mobiblu Cubisto: Who Wants to Carry a Cube in Their Pocket? The mobiblu Cubisto digital audio player comes to us from Korea and comes in two sizes, 1GB and 2GB. It's pretty much a bare bones player, supporting MP3 and WMA files formats. Obviously the hook here is its wacky cube shape, but that only gets it so far. Besides, what would you rather have in your pocket, a bulky cube or a tiny-as-a-postage-stamp iPod shuffle? No launch date is known, but expect the 1GB model to cost $90 and the 2GB version $110. If it's just a $20 difference, why wouldn't you spring for the 2GB model? A friendly note to companies: if you want us to part with our hard-earned American dollars, please don't release the same product over and over again and expect us to bite. Thank you.